John started flying in combat missions with the 36th Fighter Squadron 8th Fighter Group in New Guinea in September 1942. Flying the P-39 and P-400 John accumulated 83 missions. in the SWPA, John was asked to join up with other talented V Fighter Command pilots to form the 475th Fighter Group. The unit was equipped with the P-38H Lightings. 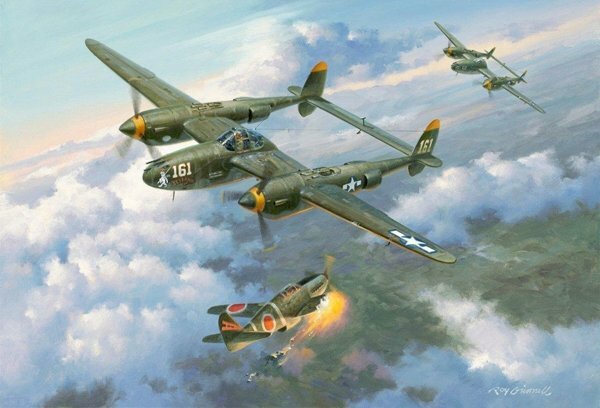 The flight saw P-38s and enemy aircraft at distance straight ahead. After combat with a Kawasaki Ki-61 Tony, 2 Mitsubishi A6M Zeros, and a twin engine fighter, John made a head-on pass with another Tony, and he saw the right wing of the aircraft peeling off in large pieces and believed one piece struck his wing man, Lt. Paul Lucas’ wing. He claimed this Tony as his first victory. The “Screamin’ Kid.” got two more that day claiming two Tony’s destroyed To make John an Ace. Johns Final kills in 1943 came on December 13th and 14th when he downed two more Zekes in the build up to Operation "Alamo" landings on Cape Gloucester bringing his total score to 11 victories. John S. Loisel completed the war as a Lt. Colonel and the 475th Group commander at the age of 25.